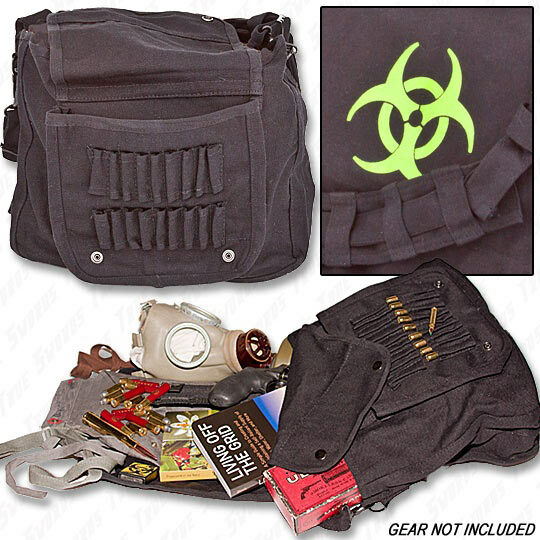 You won't find another bag as cool as this vintage biohazard paratrooper-style shoulder bag. Constructed of stone-washed 100 percent cotton canvas and printed with a biohazard symbol, you'll feel like you're carrying your gas mask awaiting the cold war going hot. It offers 3 inner compartments and 1 outer compartment with snaps and ammo sleeves. An adjustable shoulder strap ensures this bag will always be right by your side at the right height for you. 15 in. x 11 in. x 4 in. I bought this bag for myself and the Beige and Black bag for my friend. We both freaking love them. Epic style and quite durable. Very nice bag. 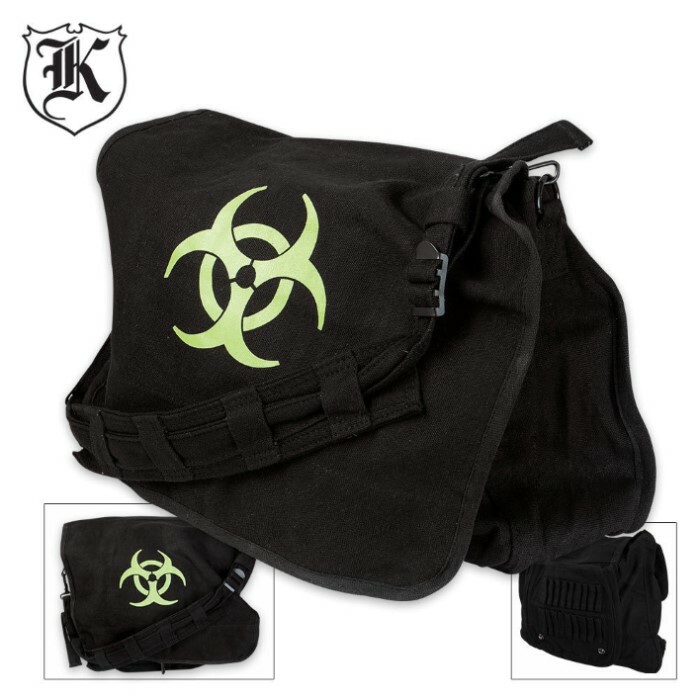 The adjustable straps are nice and strong lobe the extra pockets very cool biohazard logo a defiantly must for people one the go. It's smaller than I thought it would be, but it's a decent bag. Only if it was a little bit bigger but overall it is a good bag. Only problem is the strap. This bag isn't as big as I had thought it would be, and the strap is a bit short, but otherwise I like it, also, the stitching came off slightly on it. This bag is very nice, the ammo sleeves are a bit small for my rounds but a bit of stretching them and all was well. This bag works excellent for carying my supplies for College and the material is light also. It is a perfect deal! This little bag holds a good amount of stuff and the compartment for holding bullets also works for clicks pens and mechanical pencils. I'd recomend this for any college student. Hell I think I pretty much got one of my professors to buy this bag. AWESOME bug-out bag. The only thing I didn't like was the rather short strap. all around great bag but not the type of bag for the bigger guns and swords. would be great first aid bag or ammo storage. The only thing I can conplain about is the fact that the strap is a bit short, but I still love the product.